Extron Electronics has announced the availability of the TLS 1025M 10″ panel for Extron Room Scheduling systems. 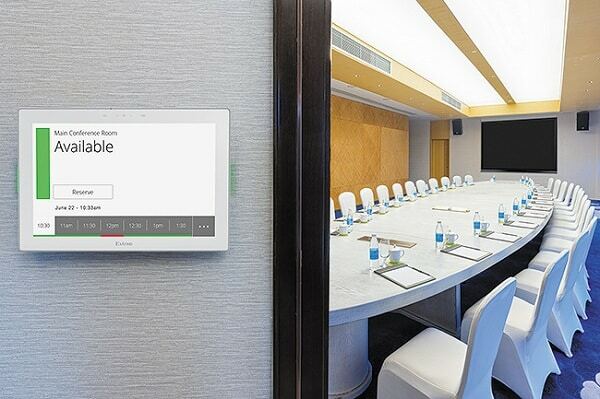 This 10″ stand-alone TouchLink Scheduling panel connects directly to a variety of popular calendar services, and requires no additional scheduling software or external processors. The panel features a 1,280 x 800 capacitive edge-to-edge Gorilla Glass touch screen that is scratch and smudge-resistant. The TLS 1025M also features Power over Ethernet (PoE), which allows it to receive power and communication over a single Ethernet cable. Two red and green LEDs make it easy to see if a room is occupied or available even from down the hall. “The new TLS 1025M has a brilliant, high resolution edge-to-edge touch screen and is the largest of our TouchLink Scheduling panels,” Extron vice president of worldwide sales and marketing Casey Hall says. All TLS panels are configured with Extron Room Agent software. Customisation options include custom colours and background images, interface text fields to be shown or hidden, depending on user preference.